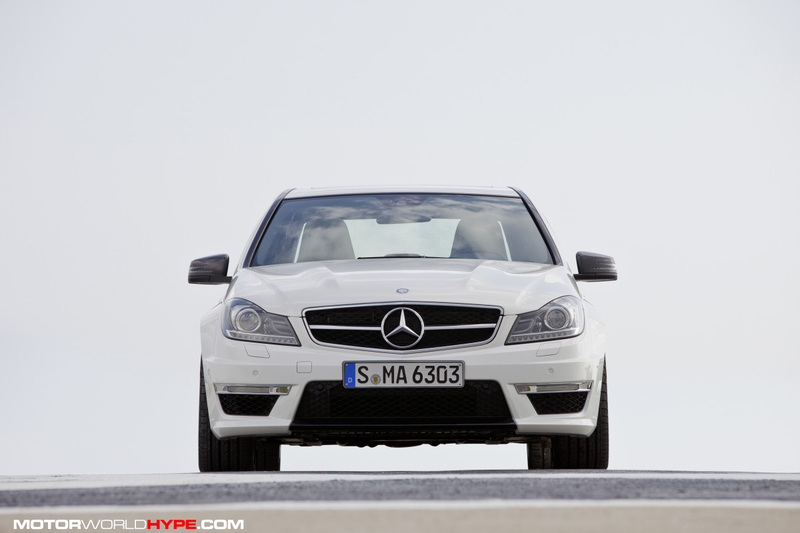 AMG has blessed the new Mercedes Benz C-Class and transformed it into the 2012 C63. Just like before the 2012 C63 will have the same 451HP V8 but there is a performance package option that will increase power to 481hp. What’s in the performance package that gives you the extra “oompf”? Well for starters they throw in the same forged pistons, rods, and crankshaft that are used in the SLS Gullwing. Then, they add a “variable intake manifold” which is painted titanium grey. All of the grunt from the engine will be put to the ground via AMG’s “SPEEDSHIFT MCT” 7-speed transmission. If you spring for the performance package the C63 will get you from a stand still to 60mph in about 4.3 seconds. The styling is still as tough you would come to expect from an AMG variant. 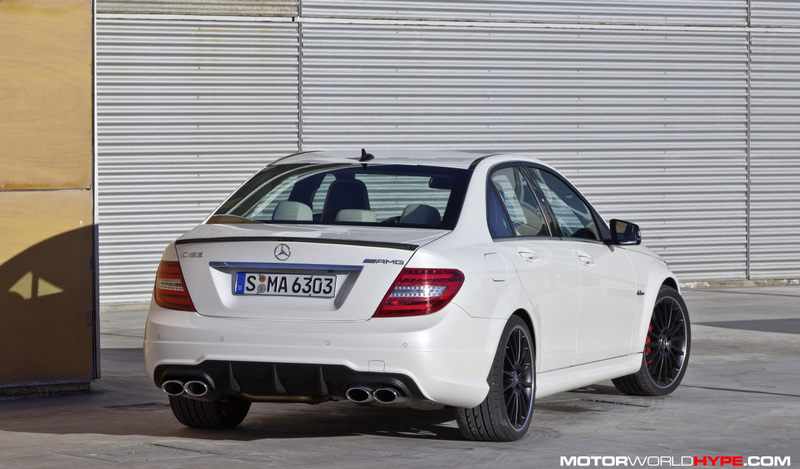 The C63’s bodylines are very “angular and beautiful” as Dieter would say (that’s a Mike Myers joke by the way). They’ve updated the gril to be consistant with the SLS styling and it has a SLS style steering wheel waiting for you inside as well. There are a few color options you can go with for the upholstery as you’ll see in a few of the pics below. All in all AMG put together a nice setup in the new hot rod. 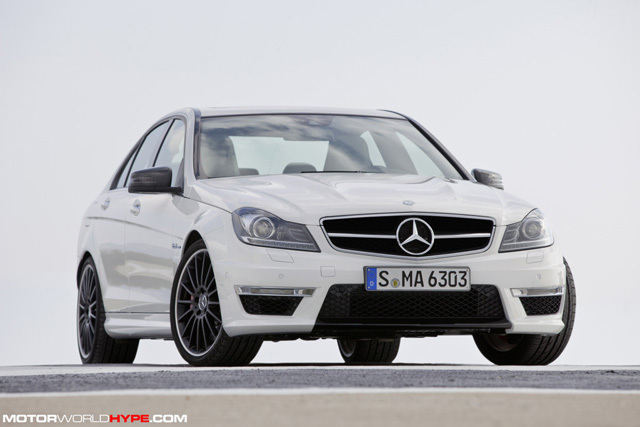 The 2012 C63 should hit dealerships this fall but so far Mercedes Benz hasn’t announced an MSRP. However, I’m going to go ahead and guess that the sticker price will be north of $60k. 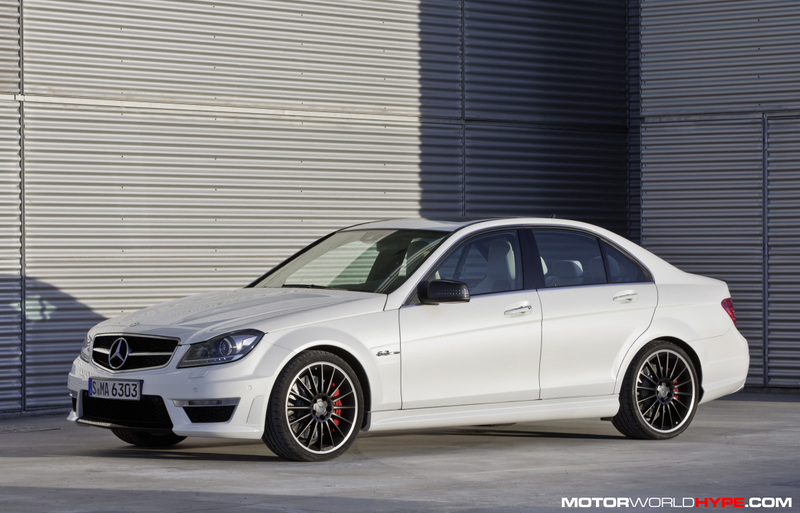 The high-performance Mercedes-Benz C63 AMG sedan is now more attractive than ever thanks to restyling for the 2012MY. The C63 AMG sedan is complemented by numerous enhancements help maximize performance while significantly reducing fuel consumption. The sedan now features the award-winning AMG SPEEDSHIFT MCT 7-speed sports transmission with standard “Controlled Efficiency” mode along with a new power steering pump that helps reduce the combined fuel consumption by about ten percent (estimated figured for U.S. models pending). The output of the AMG 6.3-liter V8 engine is unchanged at 451 hp and can be increased to a maximum of 481 hp with the optional AMG Development Package. Agility, grip and ride comfort have been enhanced as a result of numerous measures to optimize the AMG sports suspension. New assistance systems and a new generation of telematics increase both safety and comfort. The U.S. market launch for the 2012 C63 AMG Sedan begins in autumn. 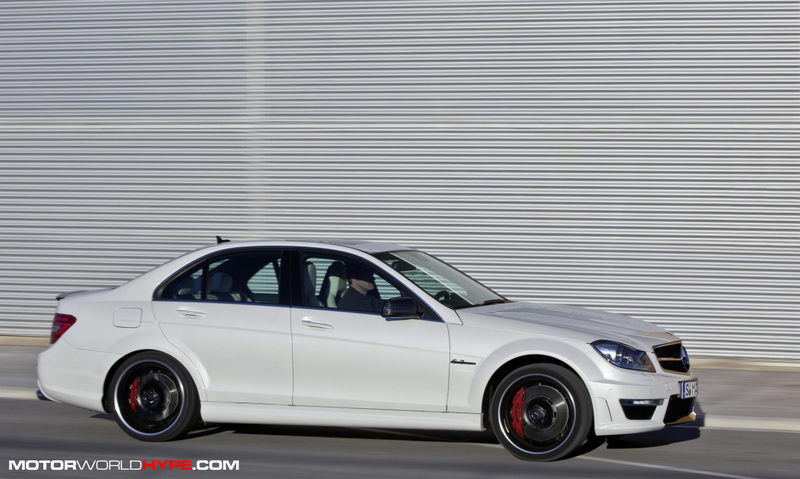 The 2012 C63 AMG sedan features a new radiator grille with a large Mercedes star and a single transverse louvre, as well as a new AMG front apron with a lower cross member painted in high-gloss black. Additionally highlights include special AMG daytime running lights and side air outlets which recall those found on the SL63 AMG high-performance roadster. New clear-lens headlamps emphasize the car’s distinctive, confident presence especially when equipped with the optional Lighting Package featuring bi-xenon headlamps. The wide front fenders with the “6.3 AMG” badge and the new 5 twin-spoke AMG light-alloy wheels — , finished in titanium grey. Good contact with the road is provided by the wide 235/40 R 18 and 255/35 R 18 tires at the front and rear. The rear of the C63 AMG now features a new AMG rear apron featuring a distinctive, black diffuser insert with three pronounced fins. Under the skin, the top C-Class model boasts a wealth of new technology including the AMG SPEEDSHIFT MCT 7-speed sports transmission – another advanced feature adopted from the SL63 AMG. This innovative transmission uses a wet start-up clutch in place of a traditional torque converter to deliver a much more efficient, agile and direct response. Fuel consumption and emissions have been reduced thanks to the “Controlled Efficiency” mode and a new power steering pump. The AMG SPEEDSHIFT MCT 7-speed sports transmission impresses with its exceptional flexibility: with four driving modes as well as rev-matching and RACE START functions, it delivers comfortable shifts around town as well as instant response in high performance driving situations. The Controlled Efficiency “C” mode is programmed to provide smooth, comfortable upshifts while maintaining the lowest possible engine speed to help maximize fuel efficiency. The “S”, “S+” and “M” modes deliver increased agility through fast, responsive gear changes and higher revs. Gear changes in the “S+” and “M” modes take just 0.1 seconds. The naturally aspirated eight-cylinder engine with its large displacement of 6,208 cc develops 451 hp at 6,500 rpm and attains a peak torque of 443 lb-ft. at 5,000 rpm. 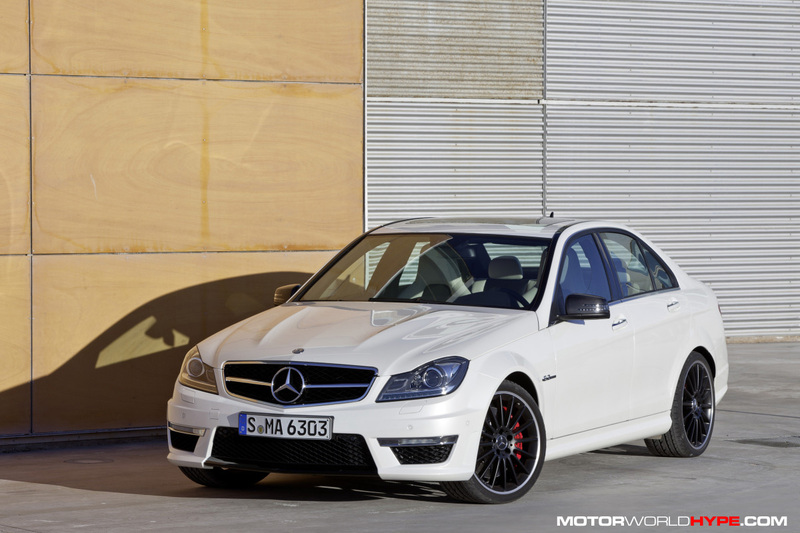 The 2012 C63 AMG retains its predecessor’s position as the top performing model in its segment with 0 to 60 acceleration in just 4.4 seconds while the top speed is 155 mph (electronically regulated). Even more dramatic performance is available with the optional AMG Development Package offering 481 hp and a 0-60 mph acceleration time of 4.3 seconds. The Mercedes- AMG engine experts have achieved this increase in output thanks to a technology transfer from the SLS AMG with forged pistons, connecting rods and the lightweight crankshaft all coming from the gullwing model’s engine. The reduced mass inertia of the components – which are 6.6 pounds lighter than those of the standard version – allows the naturally aspirated eight-cylinder engine to rev up with even greater ease and agility. Models equipped with the Development Package can be identified by the variable intake manifold painted in titanium grey under the hood, the AMG high-performance braking system with two-piece front discs and red painted brake calipers at all four corners, a carbon-fiber spoiler lip on the trunk lid and the AMG performance steering wheel in premium leather with a unique grip area. The AMG sports suspension includes a redesigned front axle, reinforced rear axle and wider front and rear track has undergone thorough modification and offers greater driving enjoyment and ride comfort at all times. The new stiffer elastokinematics, revised axle kinematics with more negative camber and new rear-axle anti-roll bar with a larger cross-section, result in higher agility and greater lateral acceleration. Additionally, new spring and damper rates have optimized both the responsiveness of the suspension as well as the road noise and tire vibration characteristics. The AMG speed-sensitive sports steering with a direct ratio (13.5 : 1) has a redesigned power-steering pump which contributes to reduced fuel consumption. This new pump only requires energy when the driver is actually making steering movements. Reliable deceleration at all times is provided by the AMG highperformance braking system with internally ventilated and perforated discs all around. Even a quick glance at the interior of the 2012 C63 AMG sedan reveals the considerable updates, such as the completely new dashboard design with an integrated screen. The new 3D color TFT display in the middle of the redesigned speedometer welcomes the driver upon entry with the AMG logo. The new threespoke AMG performance steering wheel – a feature adopted from the CLS63 AMG – is trimmed in premium leather and features metallic trim elements with a flattened top and bottom sections as well as grip areas which are specially shaped and trimmed in perforated leather for perfect steering control. Aluminum shift paddles facilitate manual gear changes. Fine trim elements in brushed dark aluminum are found on the dashboard and doors. Situated in the center console surrounded by high-gloss black piano lacquer trim is the new rotary control for selecting the transmission modes C, S, S+, M and RACE START. The special AMG sports seats with integrated head restraints and adaptive backrests are available from launch with combined M-B Tex/DINAMICA black upholstery. (DINAMICA is a new type of breathable manmade fiber). The side bolsters of the AMG sports seats are covered in M-B Tex while the center panels of the seat cushions are also upholstered with DINAMICA. Available as an option, designo leather appointments give the interior of the C63 AMG a very exclusive character: four single colors and three two-tone combinations are available. As a further option, these can be complemented with “extended black designo leather appointments” for the top section of the dashboard and the upper section of the door linings. 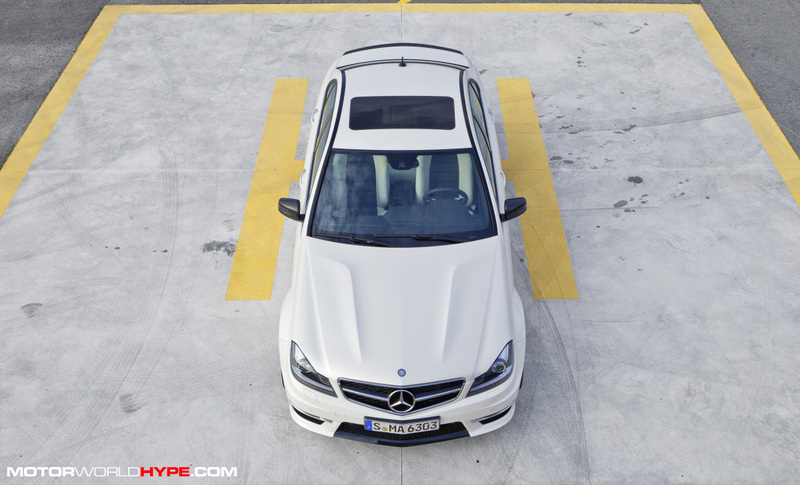 The 2012 C63 AMG features five new driver assistance systems which are already established in the S-Class flagship model line and the trend-setting CLS. These assistance systems use the latest camera and sensor technology and are designed to combat common causes of accidents. They raise the safety of the C-Class to a new level by warning the driver of a hazard. The C-Class sees the debut of a new telematics generation which will gradually be introduced in other model series. Major new features include greater operating convenience, larger displays, telephone directory transfer via Bluetooth®, wireless music streaming and a USB interface in the center console. The navigation system of COMAND Online also has added functions including a 3D display with virtual city views, eco-routes and the ability to add waypoints along your journey. Launched in the U.S. in April 2008, the Mercedes-Benz C63 AMG rapidly established itself within the performance sedan segment. 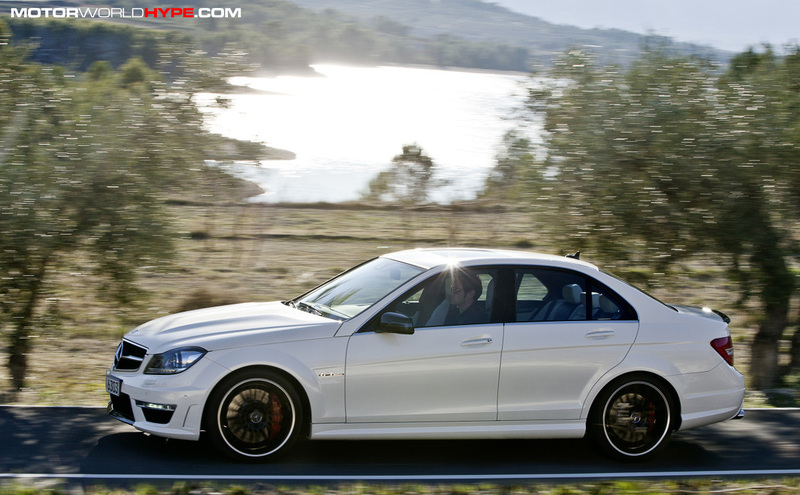 Over the past three and a half years more than 17,000 AMG enthusiasts world-wide have purchased the C63 AMG. The AMG Development Package has proven especially popular, with over 30 percent of all the C63 AMG models delivered in 2010 featuring this attractive option. 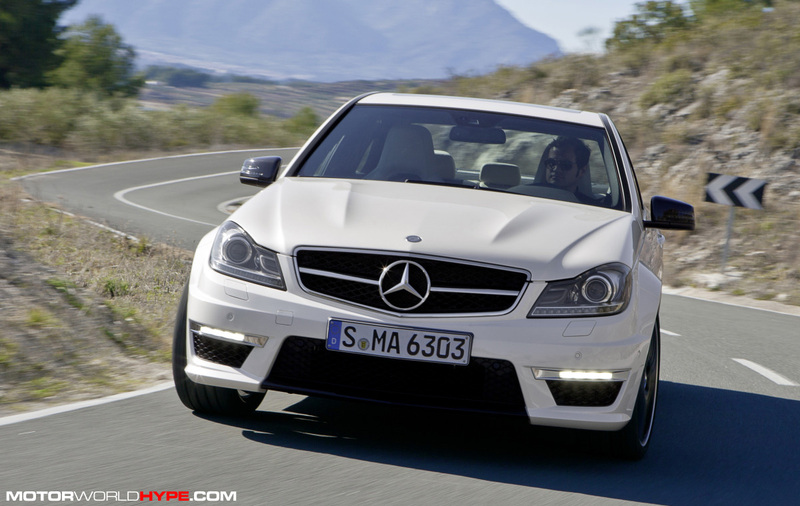 The U.S. market launch for the 2012 C63 AMG Sedan begins in autumn.